Muscles of the posterior portion of the trunk include muscles of the back, suboccipital region, and perineum region. The back is characterized by numerous muscle groups which allow movement of the shoulder, head, and neck, as well as aid in respiration and maintain posture and balance. The superficial muscles of the back are responsible for movement of the shoulder. 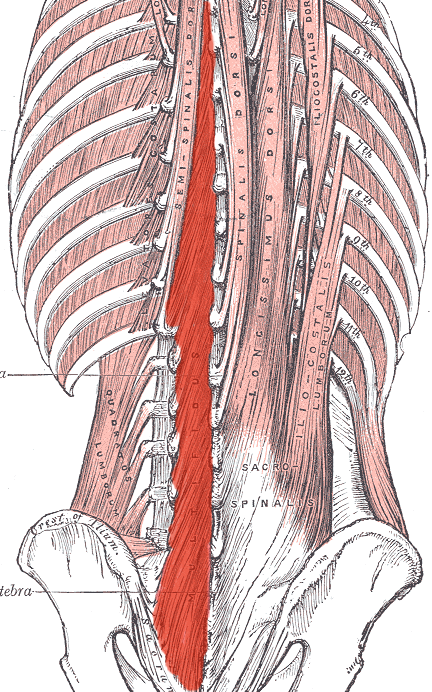 The intermediate muscles of the back assist in the movement of the rib cage during respiration. The intrinsic back muscles facilitate movement of the head and neck and are fundamental in maintaining posture and balance. The posterior or back muscles perform a wide range of functions, including movement of the shoulder, head, and neck and assisting in respiration, posture, and balance. Posterior muscles are split into three groups depending on their physiological location. 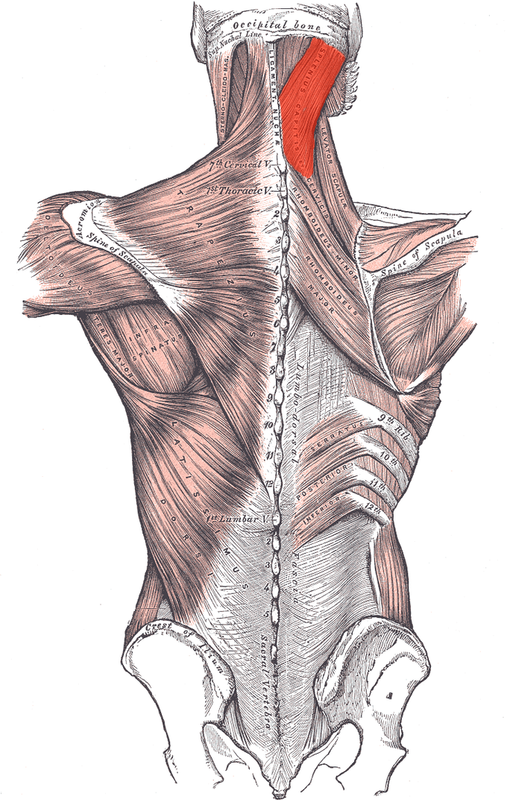 Location of the latissimus dorsi muscle: Highlighted in orange, the latissimus dorsi is a muscle of the posterior torso. The superficial posterior muscles are associated with movement of the shoulder. As the name suggests, they are the most superficially located of the muscles covering the intermediate and intrinsic layers. Trapezius: The trapezius is the most superficial muscle of the back and forms a broad flat triangle. Attachments: The trapezius originates from the skull and spine of the upper back and neck. It attaches to the clavicle and scapula. Actions: The superior region supports the arm and elevates and rotates the scapula, the intermediate region retracts the scapula, and the inferior region rotates and depresses the scapula. Latissimus Dorsi: The latissimus dorsi originates from the lower back and covers a wide area. Attachments: The latissimus dorsi originates from the lower spine and ribs and the upper pelvis and fascia of the deep trunk muscles. The muscle converges into a tendon attaching to the humerus. Actions: Extends, adducts, and medially rotates the upper arm. Levator Scapulae: A small, strap-like muscle that joins the neck to the scapula. Attachments: Originates from the side of the spine in the neck and attaches to the scapula. 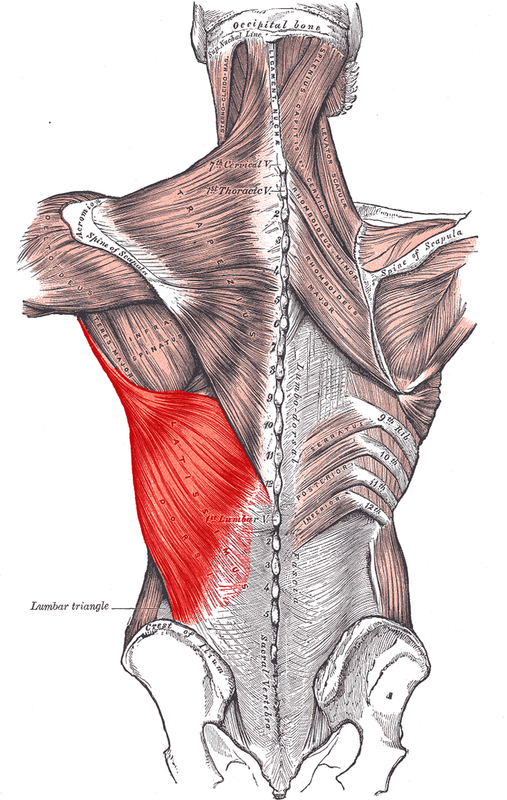 Rhomboid Major: Sits inferiorly to the levator scapulae. Attachments: Originates from the spine in the upper back and attaches to the scapula inferior to the levator scapulae attachment. Actions: Retracts and rotates the scapula. Rhomboid Minor: Sits between the levator scapulae and rhomboid major, with which it is paired in action and function, this retracts and rotates the scapula. The intermediate muscles of the posterior contribute to movements of the ribcage during respiration. Serratus Posterior Superior – The serratus posterior superior is a thin, rectangular-shaped muscle lying below the rhomboid muscles. Attachments: Originates from the lower spine and attaches to ribs 2 through 5. Actions: Elevates ribs 2 through 5. Serratus Posterior Inferior: The serratus posterior inferior is a broad muscle lying beneath the latissimus dorsi. Attachments: Originates from the spine and attaches to ribs 9 through 12. Actions: Depresses ribs 9 through 12. The intrinsic muscles of the posterior are responsible for maintaining posture and facilitating movement of the head and neck. They are divided into three layers. Two muscles in the superficial layer are responsible for rotation of the head. Splenius Capitis: This thick rectangular muscle is the most superior of the next muscles. Attachments: Originates from the upper spine and attaches to the skull. Actions: Rotates and extends the head and neck. Splenius Cervicis: A small triangular-shaped muscle located immediately below the splenius capitis. Attachments: Originates from the spine and attaches several vertebrae higher. Three columnar muscles in the intermediate layer are responsible for flexing and extending the neck as well as maintaining posture. All three originate from a common tendon associated with the pelvis. Iliocostalis: The most laterally located of the three intermediate muscles. Attachments: Originates from the common tendon and attaches to the ribs and lower neck. Actions: Extends and controls abduction and adduction of the spine and neck. Longissimus: Located between the iliocostalis and spinalis muscles, it is the largest of the intermediate layer muscles. Attachments: Originates from the common tendon and attaches to the lower ribs, spine, and skull. Spinalis: The most medially-located and smallest of the three intermediate layer muscles. Attachments: Originates from the common tendon and attaches to the upper spine and skull. Actions: Extends, flexes, and controls abduction and adduction of the spine and neck. Two muscles in the deep layer are responsible for maintenance of posture and rotation of the neck. Semispinalis: The semispinalis is the most superficial of the deep muscles. Attachments: A broad origin on the upper regions of the spine, with each origin attaching several vertebrae higher or to the skull. Actions: Extends and rotates the head and maintains posture. Multifidus: The multifidus is located underneath the semispinalis muscle, and is key in maintaining posture. Attachments: A broad origin up the length of the spine, with each origin attaching several vertebrae higher. Actions: Maintains posture through the spine.